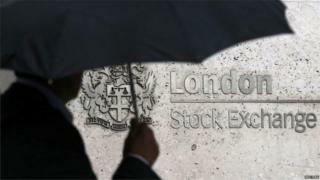 European shares have surged in Tuesday trading, despite another night of steep falls for China's market. The FTSE 100 closed up 3% and Germany's Dax and Paris Cac both gained more than 4%. European markets had opened higher but were were further boosted after China's central bank announced it was cutting interest rates. That followed two days of turmoil on China's stock markets. On Tuesday, the main Shanghai Composite index closed down 7.6% at 2,964.97 points, extending Monday's losses. Stock markets in Lisbon, Madrid and Milan, all also made strong gains. But Wall Street bucked the trend. Having initially surged all three main stock indexes in the US reversed sharply in the final hour of trading. The Dow Jones index eventually closed 1.3% lower, while the S&P 500 dropped 1.4%. "Today's move to cut interest rates... is certainly a step in the right direction," said Anna Stupnytska, global economist at Fidelity Worldwide Investment. "But while this might help sentiment, it is not enough to reverse the ongoing slowdown in China's growth. Some stabilisation in activity is probably the best case scenario. A sharp rebound is unlikely," she added. The volatile market moves have raised speculation that the Bank of England may delay an interest rate rise. However, Paul Hollingsworth, UK economist at Capital Economics, said: "Although the UK has clearly been caught up in the recent meltdown in global financial markets, we doubt that it will knock the economic recovery off course. "That said, it provides the more cautious members of the [Monetary Policy Committee] with another reason to hold fire on voting to raise interest rates."